Aaahhhh to be new LOL. You forgot to mention BIJ (big in Japan) And I was ashamed that I dind’t knew what a shocker symbol was here http://letterstotwilight.com/2010/07/13/nikki-reed-gets-some-ink-and-we-wonder-what-it-could-be/ I had to google it…. I’m ashamed to admit I still don’t quite understand BIJ. It started quite a while ago with a pic of Rob going through a Japanese airport and, though some claim it was a manip, he appeared to be a bit ‘excited in the trouser area’. So when we saw a similar pic, we called it being ‘Big in Japan’. all you need is a BIJ mention and draska comes to rescue right away. I’m posting anonymous, guess who? That has to be MP. She’s just über. That’s really more of an LTR thing. Yeah, there are LTR in-jokes that are different from LTT in-jokes. Oh, you have so much studying to do before the quiz! Thanks, TOO- thanks for completing the topic. Visuals are good instruction aids. Yes, Rob looks very tall in that picture. I can understand “Big in Japan.” Really, just look at his…height. Yes, Robsten = Rob+Kristen as a couple. Like Brangelina for Brad and Angelina. And KStew is short for Kristen Stewart like JLo is for Jennifer Lopez. Jackson is in a band called 100 Monkeys. Your stalking of Kellan’s family killed me. Choked on my pregnant lady morning glass of milk. (Someday there will be coffee again! And gin and tonics. But not for breakfast.) Somebody needs to find out what Kellan’s favorite worship song is. I’m hoping for “As the Deer”. This is a way more interesting question for some interviewer to ask than who on set has the best abs. Dear Newbies: sometimes I envy your newbie-ness but only some times. Ah, its good to review the history. 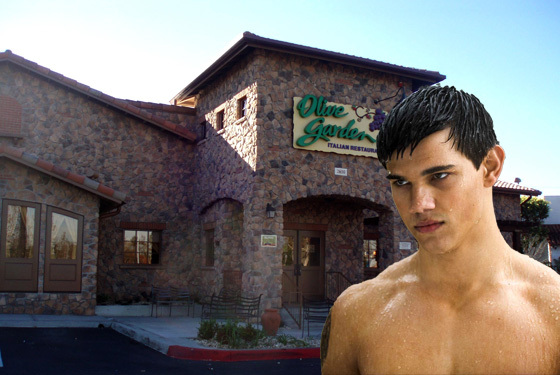 And thanks to LTT, I smile every time I pass the Olive Garden or see a commercial for them………………..
Me too! I even grin at the carrots…..
My coworker brought in all her extra halloween candy from some party she threw, and all that’s left in the jar is Werther’s Originals. I giggle every time. Even seeing dumpsters in alleys brings a smile to my face! And anything purple, green, or plaid has a whole new appeal. Funny that this is today’s topic; I was just discussing the Moantreal joke with someone (who will remain nameless, to protect the identity of the innocent…) and was trying to think back to how you gals began it. Didn’t it start with a Tweet that one of you made in August? I think? Not that it matters how it began. “Montreal” is *actually* French for “Moaning Royally” … thus, perhaps the most relevant place for Robsten to have visited. Ever. Well, I will wear my t-shirt proudly and feel like an important part of Robsten history. UC and Moon, I’m proclaiming myself TeamSwitzerland for Disqus. I kinda like how it keeps track of everything I say and how much love I get, lol. But I do miss my little drunken bush avi from the ol’ days. Anyways, you can apply my vote whichever way you please. I miss IllegalWolfLover. I guess she became all legal, flipped Chris Hansen the bird and moved on. I guess they all grew up and got a life. Sniff. I knew there were more people I was forgetting. But actually Fang and Lapush commented not too long ago. I think they just aren’t around as often. A little birdie dm’d me to say that my name was mentioned on ltt today. Thought I’d drop by to say hiiii and I miss you all! I’m always on the twitter, it’s just I really have little to say about Twilight these days. Boooooo to me. Hiiii. Must go to twitter and try figure out what you’re all talking about. Don’t hate me, but I cannot stand the new “disqus” system. It’s hard to keep track of everyone’s responses, and takes much longer to read. That said, no one can thumbsdown me for this post!!! Ha! As much as I try can´t get “They are not bears”. Related to Kristen or Bella? Quite embarrassing. I think Bella says that in NM? She says that the werewolves are not bears…right? Hi Roslyn, Yes, Bella replied to Charles “they are not bears, they are wolves, huge. ” (our portuguese version). I thought this phrase was kind a joke that I just don´t understant. I saw your name and immediately thought of my daughter because that’s her name and she loves all things Twi-related. But then I remembered that she’s only 6 and most likely not on LTT. Am I a bad mom for getting my 6 year old loving on Edward? Haha no, I’m not six. And I hope there aren’t any 6 y/olds reading things about TSwift DTF, Rob being BIJ, and Robsten “magicness” on the magic bearskin rug/carpet ride. I read this as “the magic mustache ride” Sigh. Billy Burke, look what you’ve done to me!!! Yes, Bella says “They’re NOT Bears” to Charlie and Harry in New Moon. It became a joke/funny line in the movie because of the way that she says it. It’s kind of jerky and awkward… just like Bella! I know I thought it was funny how she said it when I first saw the movie and then came here afterwards and saw that UC and others appreciated it too, which made it all the more amusing. Was your Portuguese version dubbed? I bet the delivery of the line was lost in translation. I realize how little I know about LTT with only commenting for about 10 months…. I have so much to learn still. She needs a picture drsaka to get the full aprreciation. Do you have one? I know I do somewhere in my “small” Robporn collection. Actually the discus works for me fine, but I know it doesn’t work for Cyndi and she’s sad. And she’s here a lot more than me so her vote counts more. She might not be around for a couple of days, though. Everyone send her good thoughts! You can throw my vote in for MC too. I think Cyn’s problem could be that she’s using IE, it doesn’t like Disquis very much. Oh no, poor Cyn, thanks for the heads up I’m off to e-mail her now to give her my hugs & love. IE definitely doesn’t like Disquis… it plus months of my husband’s attempts to convert me have finally driven me to Chrome… which has its good and bad points too. Yep, I’m using Chrome too, but my hubby says it’s not as secure as IE. So , he insists I still do some things (banking, online orders) through IE. Hey MC, Cyndi wanted me to let you know that she got your email, but she’s not able to respond just now and she didn’t want you to worry or think that she’s rude. She was very glad to hear from you, though! Since I can’t use TeamSeth as my name on Disqus, all of the cool features of disqus, like editing, are lost on my s/n. It’s very disheartening. The thread is somewhat easier to read since you get more space horizontally per comment and it doesn’t force justify it causing awkward spacing, however it doesn’t reload on its own (on my computer anyway), so to see any updates you have to constantly reload the comments. I’m sorry. I’m really sorry to both of you, UC & Moon. And I’m really grateful you were brave enough to go and try out a new system. But this isn’t the comment system I would’ve chosen for myself. And I wish there had been someone to vote no for me. So, no. I sure hope so, otherwise we’re all a bunch a whackadoos! How you manage to work in quotes from the movies all the time, I will never know, but I love it!! It always takes me a second to realize what you are doing, but then I laugh a lot. TS, you crack me up. You’re so right! I love LTT and almost nothing could keep me from my daily dose of “normal”, but to be 100% honest, I have stayed away lately because of this dreadful system. I have a feeling others have too. If Cyn can’t post here, and we all hate it, and there’s no goshdarn “thumbdown” option for us all to fear, then tell me, ladies, what is the point?!? I do miss the downsthumbing, oh the controversy. It feels like a whole lot of Krisbians are being shut out of expressing their feelings the best way they know how. Ah, Janetrigs. She is the one who encouraged me to come over to Twitter, and one of the few in the stand against evil (FF) with me. HATE!!! Sorry if this is already posted, but wasn’t a bear-skin rug a prominent feature in a fanfic by LolaShoes? BxE got naughty on the rug during the honeymoon in “A Life Extraordinary” … or was that the sequel? Anyway, Edward brought the rug back to their bedroom in Forks so the magicness could continue. Perhaps you subliminally worked this into LTT posts? Ohhhhh, thank you for clearing up why, when I drive past the local museum’s “upcoming events” promo banners featuring Benjamin Franklin, I always think of LTT. I had no idea why but subconsciously connected it with the hating of @janetrigs. 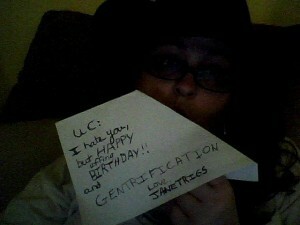 Also, @ Janetrigs= Letters to Alex, awesome. I think I could be your thestarisup when it comes to the bluesweatersuede. OK- I don’t know where, “LET’S DO THIS” comes from or where the hot pockets started. Insert lots of gun noises and Mike Newton bolting to go throw up. Hot pockets is some rob thing. Further nerdiness: one of the voices from the fake Face Punch movie is Chris Weitz. I don’t know if he’s the one saying “let’s do this!” but I like to think he is. I really do need to rewatch these movies without looking cringingly through my fingers as my hands do their best to cover my eyes, apparently I’m missing some detail. Whatever, Jake looks good in that scene, don’t pretend you covered your eyes during it. OK, nerd girl extraordinaire: What was the name of the second movie choice, mentioned in the cafeteria, and also a poster in the theater, the romance that Bella didn’t want to see? I used to know it, but my brain is a sieve and it’s driving me crazy. 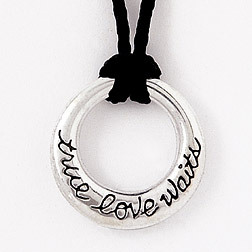 Love Spelled Backwards is Love! Dumb title, but you know, it’s a romantic comedy. Whatever happened to the commenter here with that EVOL name? :'( Such a clever girl! It’s dumb because actually, love spelled backward is “evol” which sounds like “evil”. Haha! But EVOL as a commenter name is very very clever, not dumb. I want to point out that I saw NM 6 times in theaters, once when my sister visited in April on DVD, then bought it and have since watched it 4-10 times. Plus commentary, plus the documentary, plus pausing it to relish the obvious Burger King ad placement. Though, is it positive placement if it’s on a trash can? Can Burger King patrons not even bother to throw their bag away? And why isn’t it compostable?! They should’ve gotten Burgerville onboard! ok, this is about the poll at the end of the post… I can use this disgus business at home, but not at work – that wasnt an option. Great topic today, I laughed all over again. I have been a “member” for 1.5 years and I enjoyed the refresher. Welcome all new ones, always ask questions in the comments us veterans will be happy to answer!! Didn’t Kellan’s mother kick him out of the house when he declared he was going to become an actor? What’s up with that? Lol just texted Janet to see why she hasn’t commented and she can’t comment from DISQUS (from work). This is reason enough to take out this system. Plus the fact that I cant comment on my bberry either. Sometimes I have brilliant things to share!!! Woo-hoo! I’m not a newbie anymore, I got all the jokes! AND I don’t come to LTT that religously, I’m usually at some other Letters To site. 😉 So that’s double win! I love this post and would love to have an LTR edition soon. And it’s amazing to me how much “They’re not bears” has come into convos. Oh, and I finally figured out this whole disqus thing and didn’t sign in as a guest. They’re not bears does come up in my RL conversations a lot. It’s weird. Why would it come up so naturally? But it just does. Bears must be the most popular animal in the world or something because people LOVE to mention them. Whilst making ornaments with the preschoolers, one of them said to me, “I like the bears.” “They’re not bears,” I reply giggling, “they’re reindeer!” (I then look to my left and remember that we are making polar bears too!) Ahh, good times!! No son osos! Son osos polar! Bhahaha I LOVE! See, the inner teenage boy came out and giggles at the “nuts roasting over the open fire” part. Tee-hee. *clears throat* But I’m an adult. Must.Act.Like.A.Lady. What?!? Wow, I’ve been an LTT addict for a year, and I swear, I always thought JanetRigs was actually JaneTrigs (it’s always been lowercase!). Crazy. I’m in JanetRigs denial. It will always be JaneTrigs to me. She’s always Jane Trigs in my head, too. Janet lets people think her name is Jane….we’ll actually call her that a lot. It’s a mistake that has affectionately become her nickname! Please forgive this digression, but it is an urgent message to Twilight. Take a minute today to watch the WFE trailer. Notice something about Robert Pattinson? Look at his face…his eye brows, more specifically. Why can’t you achieve that arch for Edward? How about Jane? Thinking about breaking out the hot wax for BD? I hope so. When I read the books, I got the impression these vampires are supposed to be attractive. Where in the world is Bobbygee???! WOW! I’d forgotten about that crazy Brazilian fan. I guess he couldn’t handle the devastation of the quarterfinals this July… Or rather his ‘super hot’ wife couldn’t. Very sad. Love LTT & LTR btw. You know, every time I read your name, I finish the quote in my head in Bella’s voice. Every time. I <3 New Moon. Aw thank you! I love your name also. i say screw disqus, it wont let me ‘like’ junk! it worked for a while and now its just being a stupid baby. Umm…I do believe I’m a Google-stalker. Just didn’t know there was an actual term for it. I’ve been known to stay up thru wee morning hours just to Google Taylor’s name, Taylor’s sister’s name, possible sightings of Taylor at the NFL Saints’ games, etc, etc. I’m Google-stalking Taylor Lautner!!! XD But…(say it with me) That’s Normal!! You guys are a laugh and a half. Now that you know I’m a Google-stalker, will you still be my fwend?